Property services include, Reception 24 hours, Free Luggage store, WiFi free of charge in all the property, USB socket chargers in all beds, Smoking area, Breakfast and dinner service, Laundry service, Towels for hire, Hairdryers for hire, Bicycle rental, Printing of tickets free of charge, Kitchen facility available for guests. Situated in the central part of the city, in proximity to all types of public transport. Our hostel’s location guarantees that our clients will not have any problem with moving around the city. Moreover, they will be able to enjoy Barcelona from the very first minute with us. 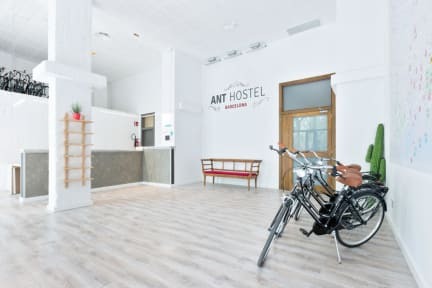 Ant Property Barcelona has taken steps to provide you with high-quality comfortable rooms, which can accommodate up to 4 persons and are equipped with two bunk beds and a bathroom with shower each. Our spacious rooms have been designed to ensure a maximum intimacy and quality experience the maximum of intimacy.All rooms are equipped with two bunk beds and a bathroom with shower. In Ant Property there are no large dormitories. Taking into consideration your comfort, all our rooms are meant for a maximum of three to four people. Our rooms are air-conditioned and have free of charge WiFi access. The bunk beds, which have been designed to fit into our premises, are equipped with reading lamps, and socket and USB chargers. When making a reservation, you can choose between a female-only or a mixed room. You can also book a whole room for up to 4 people. Great location and a fine place to stay. Breakfast was very unhealthy and bad quality though. And above all it is a lie that you sleep in a four bed room (and pay for that). It is actually a big room with 3 four-beds-and-a-shower-plus-toilet cabins in it. De cabins are open above so you hear the sound of 12 people. De door of the cabin is also open for all twelve persons and it's also very hot (uniess you open the outside door). 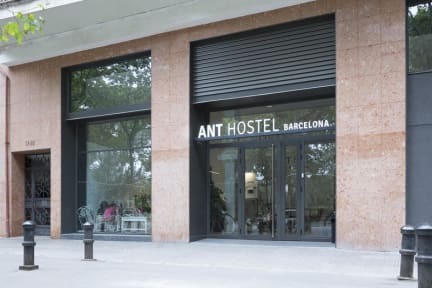 But for the rest a fine place to stay and enjoy Barcelona! !